Amazon Prime has shared a haunting new TV spot for their upcoming series Good Omens from Neil Gaiman and Terry Pratchett. The promo features David Tennant as the demon Crowley singing a dark lullaby about The End Times. You know, the perfect kind of song you want sung to you before you go to sleep! As a fan of this story I really have high hopes that this show will turn out to be great. At least we know it has a solid creative team and a wonderful cast! 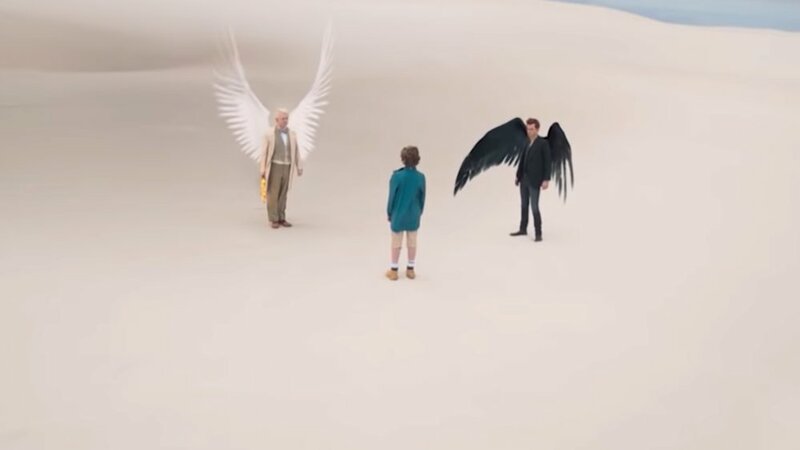 The six-part series also stars Michael Sheen as the angel Aziraphale, Benedict Cumberbatch as Satan, Jon Hamm as the Archangel Gabriel, Jack Whitehall, Michael McKean, Adria Arjona, Nina Sosanya, Ned Dennehy, Ariyon Bakare, Mark Gatiss, Derek Jacobi, and Miranda Richardson. Good Omens will premiere on May 31st.